Review date: 16 May 2001. 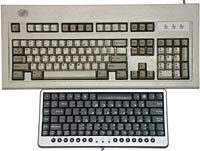 Do you have a shiny silver PC and want peripherals to match? Is albedo one of the criteria you employ when evaluating computer components? Are you, not to put too fine a point on it, impressed by shiny things? Well, have I got a couple of products for you. 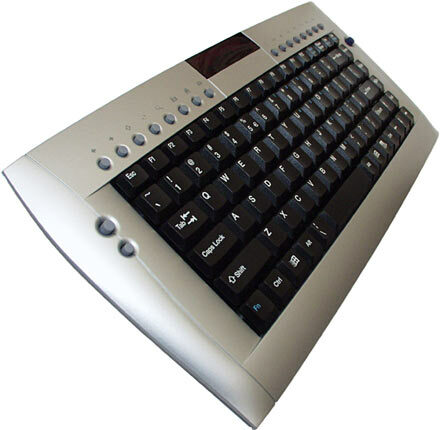 A4 Tech's GreatEYE Optical 4D Mouse and Ortek's MCK-800 keyboard are both finished in Taiwan's finest shiny silver plastic. 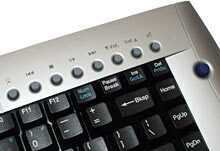 So's Zippy Technology's IR-710 wireless keyboard. Fortunately, they have other points in their favour as well. Let's start with the mouse. At $AU49.50 delivered, the GreatEYE Optical 4D Mouse's price undercuts the popular big-name optical mouses by a large margin. Logitech and Microsoft optical mouses can't be had for less than $AU70 delivered. The IntelliMouse Explorer is still more than $AU90. Even a Dexxa optical mouse like the one I review here will set you back $AU71.50. And yet the GreatEYE mouse has the same optical sensor as the big names offer, which means it has their other basic good qualities, too. It works on pretty much any surface that isn't translucent, transparent or reflective, and it never needs cleaning. Well, except to get the odd bit of schmutz off the mouse feet, anyway. 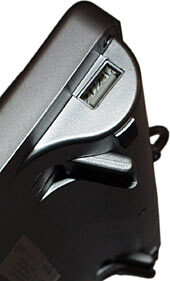 And it's got a PS/2 plug on the end of its cable, so you can use it with pretty much any somewhat recent PC. The problem with many cheap Taiwanese mouses is that their ergonomics suggest that they were designed for the moist, suction-cupped tentacle-hands of Lovecraftian batrachian abominations. Well, not for humans, anyway. The more buttons these funny looking mouses have, the worse they're likely to be. You can end up having to deliberately bind no function to the buttons you can't help clicking every time you touch the darn thing. So I approached the GreatEYE with a certain trepidation. Because it's got five buttons, and two wheels. Right and left buttons, right and left side buttons (one easily pressed with the thumb, one not so easily pressed with the ring finger or pinky), and the forward wheel can be clicked down, too. The rear wheel's just a wheel; you can't click it down. Both wheels click as you turn them, though. They're not the smooth-turning no-detent wheels that some Taiwanese mouses have, including the earlier, cordless, A4 product I review here. The GreatEYE is, surprisingly, actually useable. This is pretty much entirely because its design is... inspired... by Microsoft's offerings. 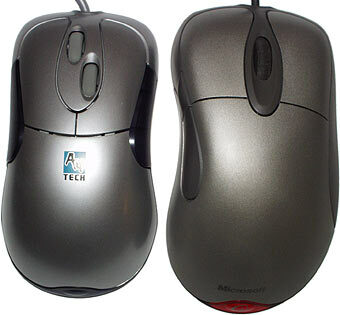 The A4 mouse looks like a cross between Microsoft's IntelliMouse Explorer and IntelliMouse Optical - it's silvery with dark side buttons, like the Explorer, but it's symmetrical, like the Optical. 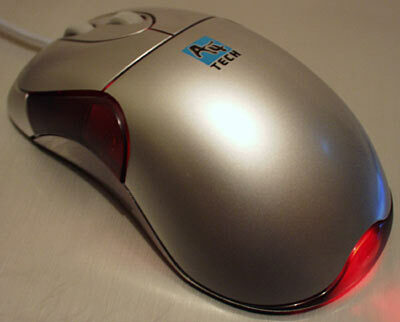 The similarity extends to the sculpted tail light at the back of the mouse. The GreatEYE is smaller than the Explorer - which is just as well, as Microsoft's flagship mouse is as big as most people can reasonably handle. It's got an inward grip-curve under its side buttons, and should be quite comfortable for anybody to use, regardless of their hand size. 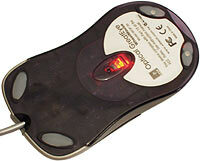 If you just plug the GreatEYE mouse in and start using it, it behaves as a normal three-button wheelie-mouse. The side buttons do nothing, but the second wheel has a function - each click up or down is equivalent to two clicks of the other wheel. Install the support software for the mouse (you can get the latest version from the download page here), and you can do fancier things in Windows 95, 98, 2000, NT4 and ME, binding buttons to different Windows-y functions, and setting the second wheel to scroll sideways, or zoom in applications that support it. For the money, this is a nice mouse. The button feel is fine, the wheel feel is rather light but at least the things click, you're not likely to be pressing the side buttons by accident all the time, and it looks good, too. On to Shiny Thing Number 2. Ortek make various not-particularly-notable keyboards. Their product page is here. But recently, they've started making these little ones. The $AU79.20 (delivered) MCK-800 is the funky silver version with a PS/2 connector. Well, I think it is, anyway; perhaps it's meant to be called the MCK-91; that's what the local distributor thinks. But the one I got had a sticker on the bottom that said MCK-800. Anyway, there are various other colour and plug permutations. ...with a two port bus powered USB hub built in. There's another port at the other end of the back of the keyboard, opposite the one shown in this picture, which is a pretty good layout for a gadget this small. 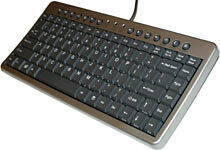 This version of the keyboard's $AU93.50 delivered. Regardless of colour and connector, all of the mini Ortek keyboards are pretty obviously a cheap laptop keyboard module, put in a case just big enough to hold it. Add cable, indicator LEDs in the middle, the usual little flip-down stand on the underside, and you're pretty much done. 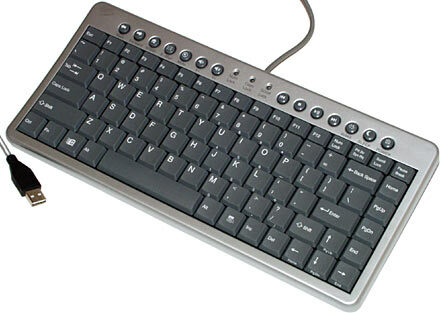 Because this is a laptop keyboard, the keys are full-size, but there aren't as many of them as usual. There's no numeric keypad, there's no T-arrangement of cursor keys (they're on the bottom rank next to the shrunken space bar), and the F-key row is slightly miniaturised. The keys also don't have a lot of vertical travel. 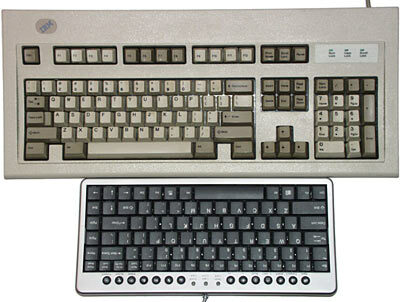 The up side of all this, of course, is that the Ortek keyboards are small compared with a normal 'board. Or an abnormal one. Here's the PS/2 Ortek next to one of my battleship IBM 42H1292s. I know which of the pair I'd rather have in my hands if the situation called for an improvised weapon, and it's not the cute little silver thing. But I also know which one I'd rather be forced to carry around in a backpack, and it's not the one that's built around a big steel slab. 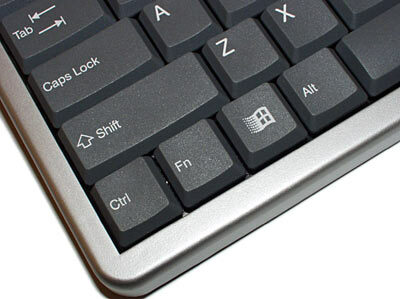 Like other laptop keyboards, the Ortek has a "Fn" key that lets you access keypad functions - you read the fronts of the keys to see what keypad key they emulate. And it's got Windows keys as well, crowding up the bottom row and bringing the total proper-keys count to 87. To make the keyboard look less like an escaped laptop component, Ortek have added a row of 14 little round buttons at the top. They provide similar extras on some of their fancier full-size keyboards, including the older model "Eagle Touch" 'boards I review here. If you're running Win98 or later, three of these buttons can do things without any special software. I'll get to them in a moment. The others need you to install the bundled driver software, though; you can get the latest version from the Ortek download page here. The driver enables Web navigation keys that go Back and Forward, open your default browser, and open your default e-mail client. There are volume up, volume down and mute keys. There are forward, back, play/pause and stop keys for videos and sound clips, which may or may not work with the player program you're using. If you don't install the driver software, the aforementioned special keys do nothing. But the last three still work, though you might wish they didn't. The three wicked witches are Wake, Sleep and Power. Sleep puts your ATX-compliant PC - assuming you have one - into sleep mode, if it knows how to do it. If it doesn't, nothing should happen. If you're unlucky, your PC will go to sleep and never wake up until you cycle the power, and lose what you were doing. Or it may go to standby, wake up when you want it to, then hang. Hurrah. If you press the Sleep key by accident, tough luck. Your computer's going into standby mode whether you like it or not, and only if there's something somewhat important happening that standby mode would interrupt - like a dial-up Internet connection - will you get an are-you-sure prompt. The Wake key isn't actually particularly evil; it's just dumb, because pressing any key should wake up an ATX machine that's in standby. The Wake key is an Any key. The Power key makes up for the Wake key's innocuousness, though. Press Power and, unless you've got applications with unsaved data, your ATX-compliant PC turns itself off quick smart. Well, it probably does; some PCs will try to go into Hibernate mode instead, I think. Hibernate is like standby, only more likely to go wrong. A game of Tribes 2 in which you're just about to break a nil-all flag-capture deadlock in the last fifteen seconds of a two hour round does not count as "an application with unsaved data", in case you were wondering. Press power while playing a game and great will be your lamentation. Personally, I don't know what the heck a power button's doing on a keyboard. Yeah, I know Macs have them; Mac OS also has the decency to give you a confirmation box when you press the darn thing. Windows won't do that, and there are various other, safer ways to access the shutdown procedure, anyway. Start -> Shut Down..., of course, but also control-alt-delete and then clicking the Shut Down button, for instance. Or, of course, just a stab at the power button; ATX-compliant machines should interpret that as a shutdown command. All of these methods are less likely to spoil your computing mood, because you're less likely to do them by accident. Rant concludes. Thank you for your patience. 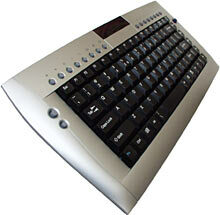 The cheerily named Zippy Technology Corporation make this, their IR-710 Wireless Keyboard. The "IR" in its name indicates the communication method this keyboard uses; it's infra-red. That means it needs line of sight between the two transmitter LEDs under the dark plastic cover on the back of the keyboard and its receiver unit - but, like many remote controls, it's not very touchy about alignment of the two components, as long as they're not too far apart. 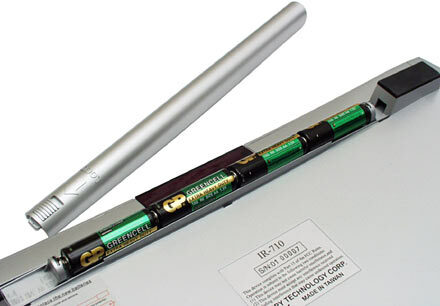 The IR-710's range is quoted somewhat optimistically as seven metres (21 feet), but it'll certainly manage to work just fine across any normal room, as long as the receiver can see the transmitter. The receiver draws power from the PC it's plugged into, and connects to the normal PS/2 keyboard and mouse sockets. As with various other "couch keyboards", this one includes a mouse function as well. The "mouse" is a TrackPoint force-stick, as seen on various IBM notebook computers. TrackPoints have proportional response, so it's not like steering your mouse with a Game Boy D-pad, but you're still not going to be ruling any Quake 3 servers if you choose this thing as your control system. For controlling business presentations or DVD player software, though, it's fine. ...while the eight on the other side are mainly for Web navigation. This side also has the two "mouse" buttons. 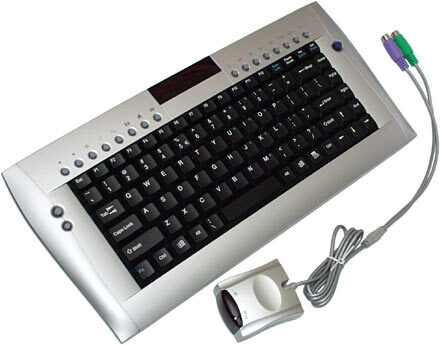 The TrackPoint and regular keyboard keys are all just a plug-and-go proposition; you can attach the receiver to any computer with PS/2 sockets and use it, right away, without installing software. If you want to use the top-line buttons, though, you have to install the included Windows-only driver package, which also lets you redefine what the keys do. The Zippy's keyboard feels nicer than the Ortek 'boards; there's more key travel, and the 'board itself has a slight horizontal convex curve that makes it a bit more comfortable to type on. Nothing's going to turn a keyboard sitting in your lap into an ergonomic tour de force, but this thing's not so bad. Unless, of course, you need a numeric keypad. Once again, you've got to press the "Fn" button to swap the function of a block of keys, if you want keypad functions. 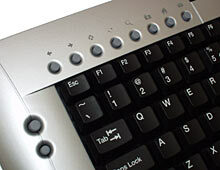 The IR-710 runs from four (included) AA cells, which mount in this neat in-line bay, in between the keyboard's fixed rubber-based back feet. When it's sitting there doing nothing, the Zippy 'board draws about one milliamp (mA) from its batteries. Type frantically and it draws about 26mA; use the TrackPoint and it draws about 38mA. Right after doing something, it draws 4mA, but after less than a minute of inactivity it drops back to its 1mA snooze mode. So if you put batteries in this keyboard and never actually use it, it'll probably take about a hundred days to flatten a set of fresh alkalines. How long the batteries will last with the keyboard in actual use is hard to say, because it depends on how much you do with it. Flat minimum is less than three days, but that assumes you're sitting there with your thumb on the TrackPoint scooting the cursor mindlessly around the screen non-stop. Not many people can spend that long in their easy chair. Realistically, if you're using this thing to control your show-off living room DVD and MP3 box, I wouldn't be surprised if a set of AAs lasted for two months. Maybe one month, for more serious use. But if you're hammering away at your keyboard all day, you'll probably prefer something a bit more solid. For $AU132 delivered from Aus PC Market, this is a good product. It's got interesting curvy Star Trekky styling, but it's not an unusable design exercise that no human can operate. Its range is decent, it feels not too bad to type on, and if you don't care about the little rubber buttons along the top, you can just ignore them. These are all good products. 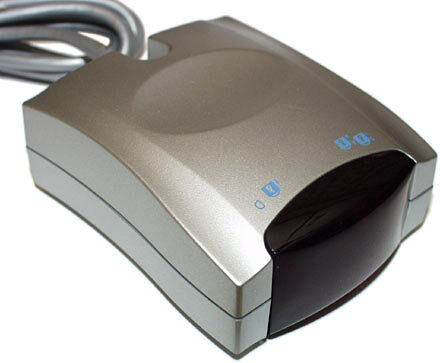 The Optical GreatEYE 4D VeryLongName Mouse lets you get a decent optical pointer-pusher for the price of the better ball mouses. 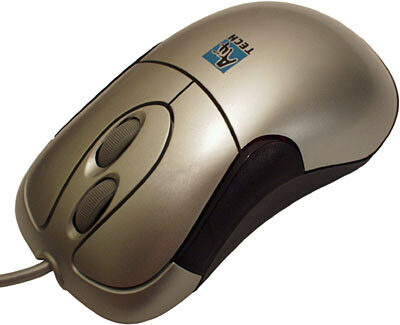 I don't recommend anybody buy a mouse sight unseen; different people prefer different shapes and sizes of mouse, and "ergo" designs like this one don't suit some people. But this one, at least, has no obvious traps. It's not really big or really small, it's not asymmetrical and so hard to use for left handers, its side buttons aren't poorly placed. And you can't beat that price. The little Ortek keyboards have more specialised appeal. For general computing purposes, any yum cha full sized keyboard for half the price will give you better key feel, and proper cursor and numeric keys. It'll probably be louder, though; if you want a really quiet keyboard, cheap laptop 'boards are pretty good. Compared with the clickety-click IBMs I use, the MCK-800 is whisper-quiet. But it feels like typing on a piece of stale cheddar. The MCK-800's not meant to be a general purpose keyboard, of course. If you want something small and light to carry around and plug into, say, keyboardless servers lurking in cupboards, or your natty little Saint Song Espresso or Cappucino pocket-PC, this thing's just right. And it'd look good on a cramped reception desk, too, as long as your receptionist either doesn't have to do a lot of typing, or doesn't mind doing it on a cheapo laptop 'board. LAN party enthusiasts might also find a use for the MCK-800, as an easily packed emergency keyboard if not as their gaming 'board of choice. 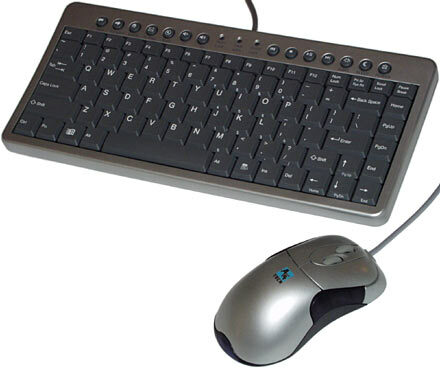 If the Ortek keyboard were as cheap as the A4 mouse, it'd be a great product. As it is, it's great if you need it and lousy if you don't. But, again, if you just want something shiny, it's highly recommended. As is the Zippy Technology keyboard, if cable-free operation matters to you. This thing really could be used as a prop in a show about the early days of human interstellar travel, it's not stupidly expensive, and it feels nicer than the Ortek 'boards. If you don't need wirelessness then there's no point paying the premium; if you do, check this little sucker out. Readers from Australia or New Zealand can purchase all sorts of shiny things from Aus PC Market.